Every day, your skin is exposed to free radicals - unstable molecules like pollution, sun and stress which damage the vital skin cells like collagen and elastin that keep you looking fresh and young. One of the most damaging free radicals is the sun's rays. UVA rays have the same strength everyday, all year long. Antioxidants counteract free radical damage by trapping and containing them, preventing further damage to skin cells. 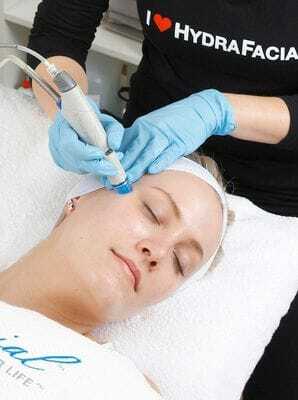 The HydraFacial utilises some of the most powerful antioxidants to revitalise and protect your skin. Skin Health for Life is not just improving your appearance, but actually restoring youthful, healthy skin. Skin Health is lifestyle, requiring monthly maintenance and the right treatment for every skin type. That treatment is the HydraFacial. The HydraFacial treatment merges soothing and invigorating spa therapies with advanced medical technology to achieve instant, lasting results. Each treatment uses a series of patented HydroPeel tips - each one has multiple abrasive edges to exfoliate the skin several times each pass, achieving better, more even results. Dead skin cells are removed to reveal healthy new skin. This gentle peel helps loosen dirt and debris from pores without irritation. Painless, automated extractions use vortex suction to clean out pores. Antioxidants and Hyaluronic Acid are Vortex-Fused to nourish and protect.